At just about the time the rest of our Bud n’ Mary’s group were touching down at Heathrow Airport, Terry Thomas and I were climbing into the back of Capt. Mark Hall’s pick up truck. After a twenty minute run through the then still dark Miami suburbs we pulled off the main rod, and followed a rough dirt track down to a launch ramp leading into a narrow, weed choked canal running behind a large department store. Here we launched Capt. Mark’s skiff then ran a couple of miles through Miami’s extensive and complex system of inland waterways, eventually arriving at a large lagoon flanked by large and clearly very expensive waterside homes. 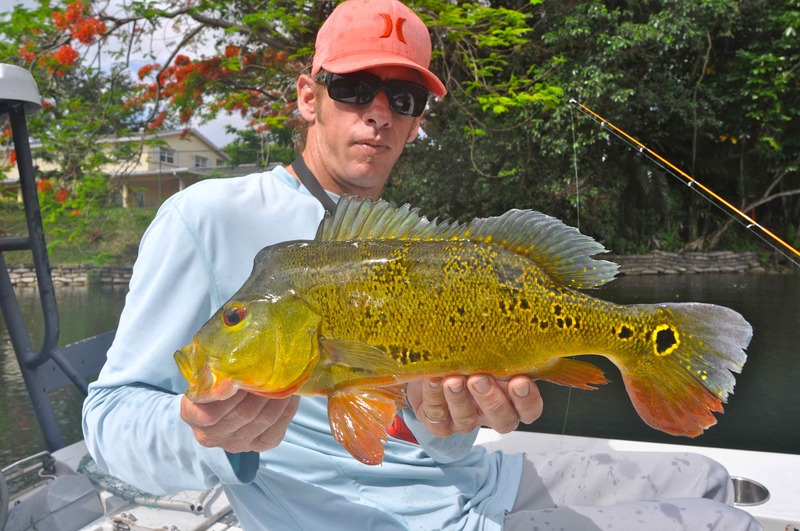 The colourful peacock bass, an introduced species that thrives in the freshwater waterways around Miami. 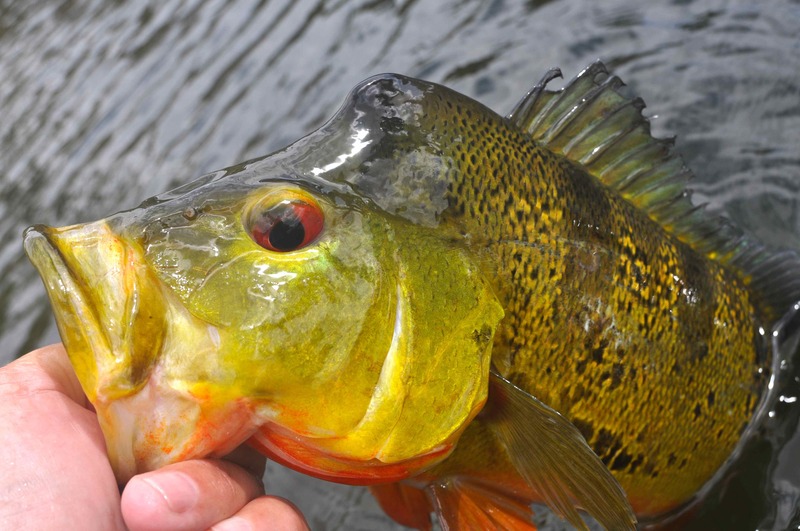 Terry & I had been given the option of either throwing plugs and other artificials on spinning rods, fly fishing, or free lining live ‘shiner’s’ on small circle hooks. Having been assured that the latter was by far the quickest and most reliable way to ensure our target species ended up in front of my cameras, that was what we elected to do. We were fishing for peacock bass, butterfly peacock bass to be precise, a species native to the Amazon basis. 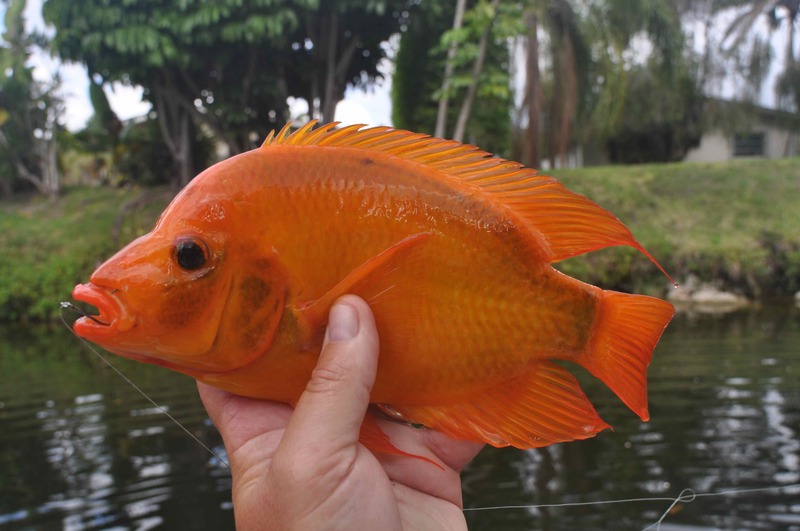 These beautifully coloured and highly regarded sports fish were first introduced into the canals around Miami in the 1990’s, in an attempt at controlling the rapid rise in alien freshwater species that then, and now, proliferate throughout the region. With minimal tolerance to cold water biologists had assured there was no way that spawning peacocks could extend their range northwards throughout the state. 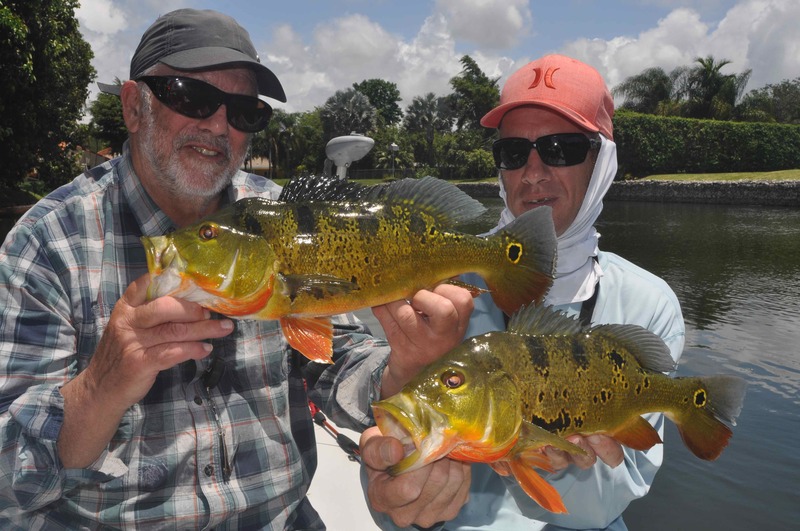 The rest, as they say, is history, and today you’ll find a fantastic peacock bass fishery right in the heart of the city suburbs, and extending out west into The Everglades. Terry Thomas & Capt. Mark with a fine brace of peacocks. 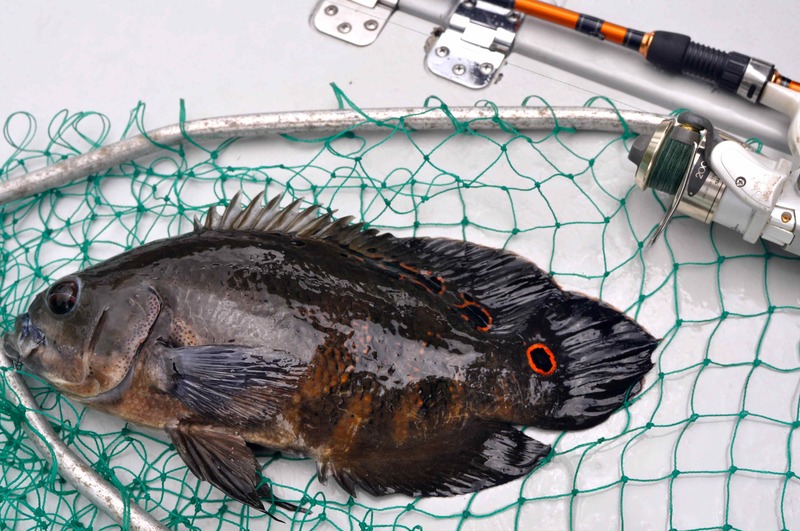 In no time at all I had hooked and boated our first peacock, a chunky 2-3lb fish, which seems to be the average size. 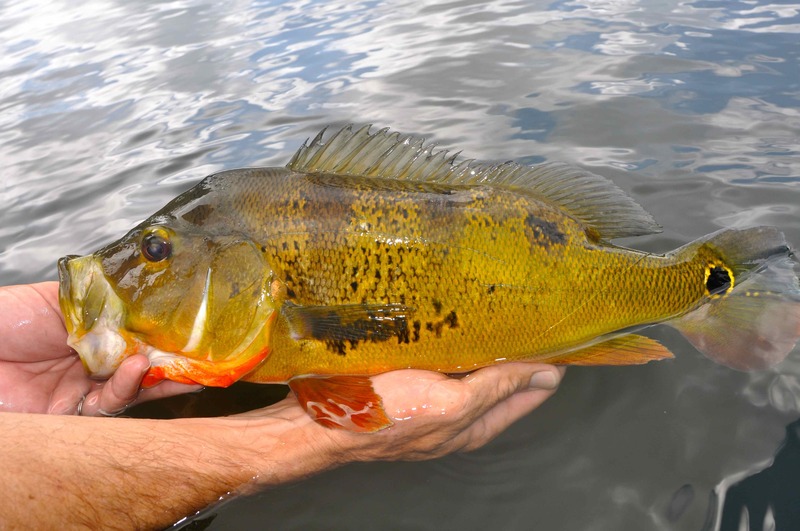 Throughout the eight hours we fished we caught peacocks at a constant and steady rate, our biggest nudging the top side of 5lb; double figure specimens have been caught. In addition to peacock bass we caught numerous largemouth bass, and several so called ‘alien species’ including Midas and Mayan cichlid’s and oscar’s, fish you’d typically pay a small fortune for at an aquarium shop back home. How much would an oscar this size cost in an aquarium shop in the UK! After saying goodbye to Terry at departures I grabbed a coffee and wandered downstairs to arrivals. I was just in time to meet a travel weary Mrs Lewis for two weeks holiday, starting with three nights at Fort Lauderdale, followed by 5 nights at Orlando, finally ending with a week on the beach at Sanibel Island. 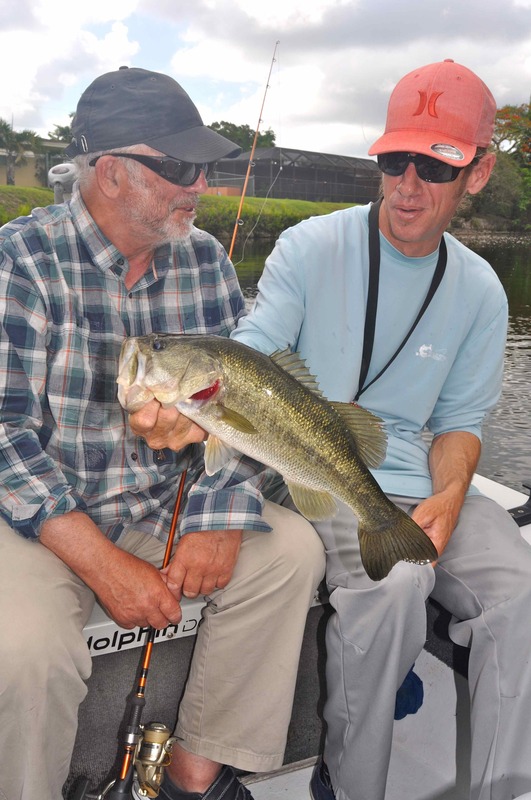 After 8 days solid fishing I was ready for a break during the first week, but by the time we checked in at our hotel on Sanibel I was ready for another cast. My original intention had been to fly fish at day break for trophy snook in the surf along the white sand beaches on Sanibel’s Gulf Coast, but strong onshore winds had churned the water to a milky soup. 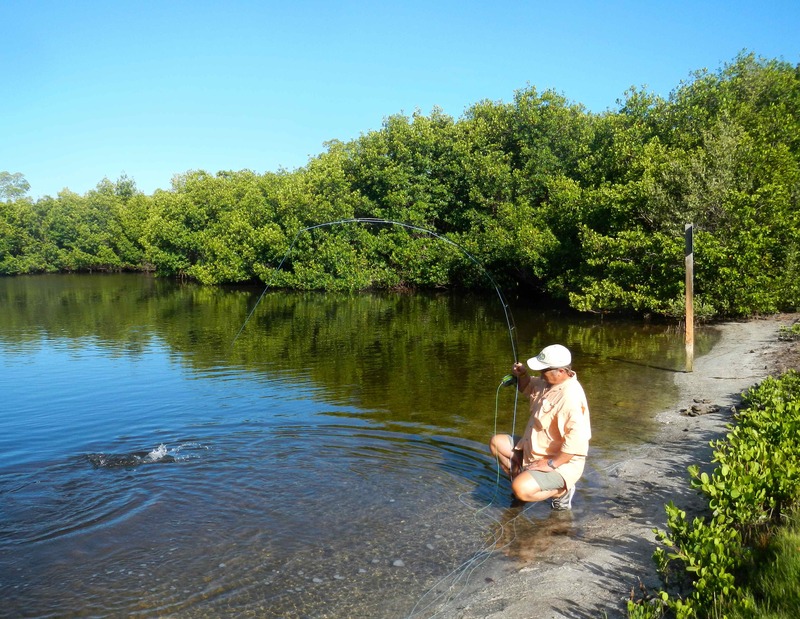 Luckily I had a plan B, which involved fishing throughout the plethora of mangrove channels and lagoons that are easily accessed via the four mile wildlife drive running through the J.N. Ding Darling National Wildlife Refuge. Once again snook were high on my target list along with redfish, speckled trout and ‘hopefully’ tarpon. Hooked up to a lively fish! As much as I love fishing with good guides, I find most pleasure from finding and catching my own fish, especially with a fly rod. 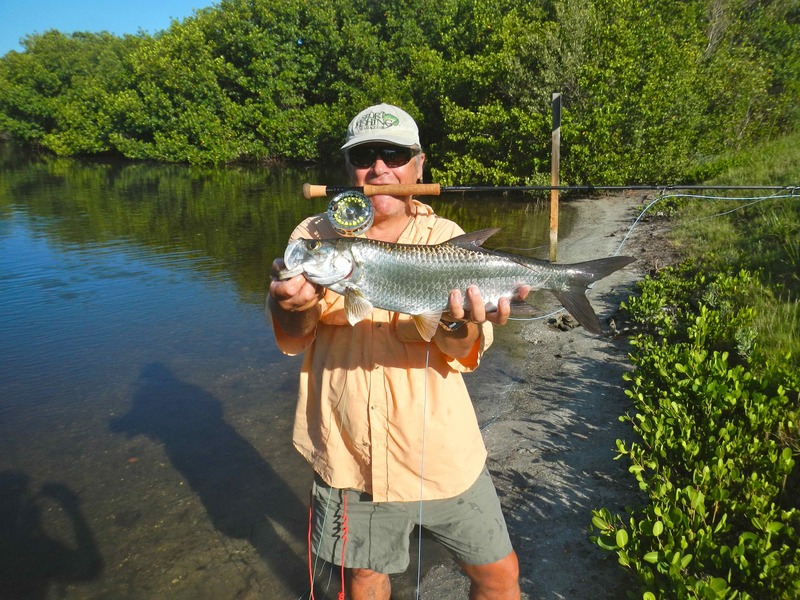 Over the years I have caught a large amount of self-guided snook, bonefish, trout and many other back country species, but never tarpon. The first morning I drove into the Ding Darling refuge I found a small bay tucked amongst the dense mangroves with dozens of fish rolling on the surface, fish I could clearly see were tarpon. Grabbing my fly rod I hastily tied on a home tied cockroach fly and started to cast. I got a solid hit on the second cast, not a tarpon but a welcome snook. 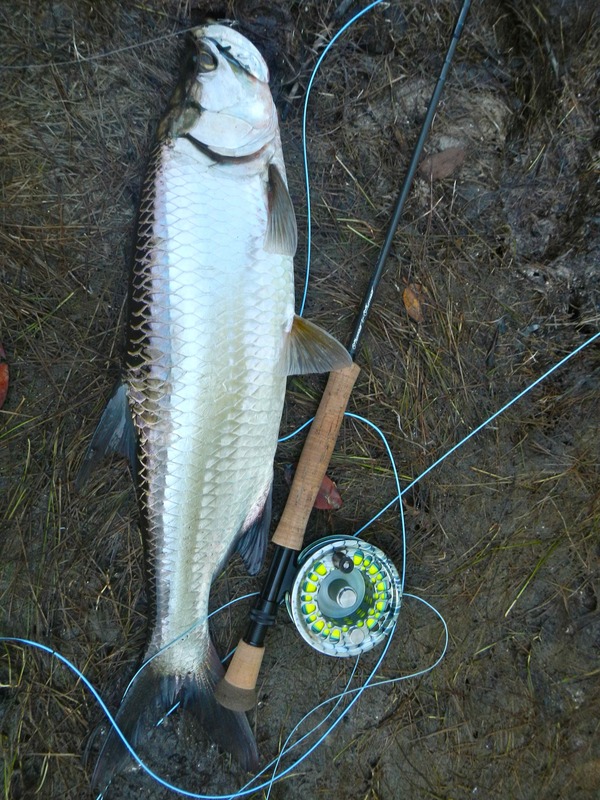 I got my tarpon a few casts later, a perfect little specimen of around 6lb that fought magnificently on my fly rod, spending more time in the air than the water. As the sun got higher the rises became fewer and farer between, but by the time I drove home for breakfast a little over an hour later I had caught and released a brace of tarpon along with a couple of snook. Hoping to get a redfish to complete a backcountry slam I went back in the evening. I didn’t get a red, but consolation came by way of a third, near 10lb tarpon. Needless to say for the duration of our stay, most mornings saw me first first in line to access the refuge when the gates opened at 0700! 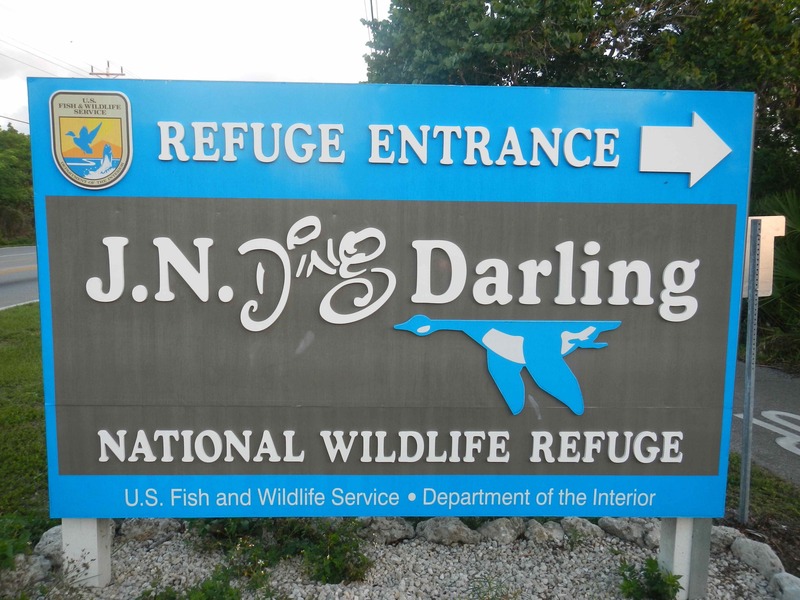 Few areas are easier to access and fish as the J.N.Ding Darling National Wildlife Refuge on Sanibel Island.